Heat oven to 350°F. Spray 15x10x1-inch pan with cooking spray. In medium bowl, mix Crust ingredients with fork until well blended. Press evenly in bottom and up sides of pan. Bake 10 to 14 minutes or until set. Cool 10 minutes. Meanwhile, in 4-quart saucepan, cook milk and pudding mixes over medium heat 10 to 14 minutes or until mixture comes to a full boil, stirring constantly. Remove from heat. Add chocolate chips; stir until melted and smooth. Pour into baked crust; spread evenly. Cool at room temperature 15 minutes, then cover filling with plastic wrap. Refrigerate at least 2 hours or until set. When ready to serve, remove plastic wrap from filling. In large bowl, beat cream cheese and marshmallow creme with electric mixer on medium speed until smooth. Beat in whipped topping. Drop by spoonfuls over chilled pudding layer; spread evenly over top. In small microwavable bowl, microwave frosting uncovered on High 10 to 15 seconds or until thin enough to drizzle. 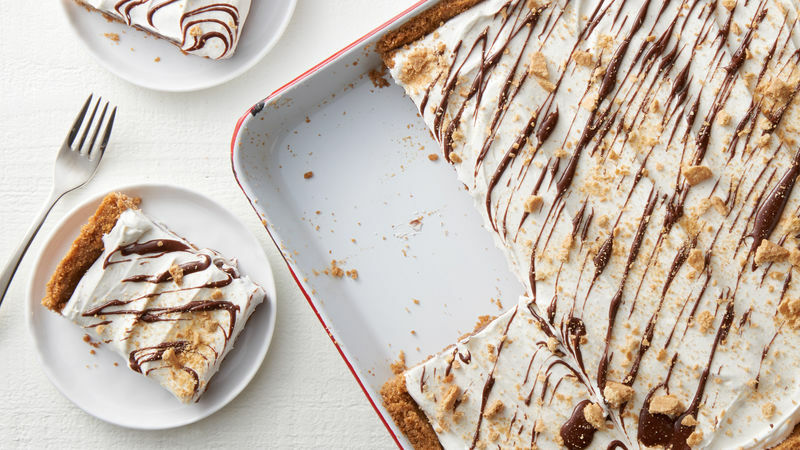 Using a fork, drizzle warmed frosting and sprinkle 1/4 cup graham cracker pieces over top. Cut into 4 rows by 4 rows. Cover and refrigerate any remaining pieces. To ensure success of this recipe, be sure to use pudding that is cooked on the stovetop and not instant. No dark chocolate chips? Replace with semisweet chocolate chips.